Your Lincoln Stars will return to the IceBox for one game this weekend when they faceoff against the eastern conference Cedar Rapids Roughriders on Friday night. 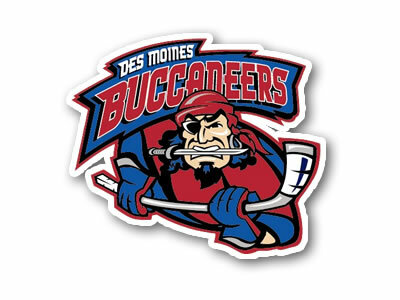 The black and blue will then will go on the road to Des Moines to play the Buccaneers on Saturday night. The puck will drop at 7:05pm CST for both games. If you can't make to the games this weekend in Lincoln and/or Des Moines, you can follow the boxscores online via Pointstreak, listen to Stars radio announcer Mike Melbye on KLMS 1480 AM, or watch the games on FASTHockey for a fee. Lincoln enters this weekend with a record of 27-14-4 (58 points), and are in sole possession of second place in the USHL Western Conference. The Stars are only one point behind the first place Omaha Lancers (59 points), and Lincoln has one game in hand. Click here to see the current USHL standings. 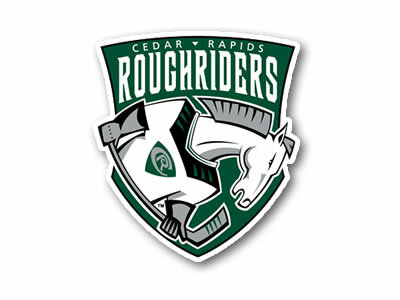 First up for the Stars this weekend will be the Cedar Rapids Roughriders (aka Green Weenies, Cedar Rapids Olympic Diving Team) who have a record of 19-18-8 (46 points, fifth place in the USHL Eastern Conference). This will be the second, and final time the Riders and Stars play one another this season. In their only other meeting way back on 10/28/11, the Roughriders beat the Stars by a score of 4-3. Although they are a hair above .500, the Roughriders are definitely having a down year compared to most seasons under head coach Mark Carlson. 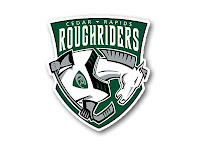 CR has been hit hard by injuries, and they are a young team with not a lot of prior USHL experience. They also have had issues winning games away from home. The Roughriders are 1-7-0 in their last eight road games, and have been outscored 15-2 in their last three road games. CR has a dismal overall road record of 6-14-3 which would seem to favor the Stars who own one of the best home records of 16-6-1. I tend to rib the Roughriders a lot on this blog for playing a sometimes soft, European style of hockey. They aren't afraid to dive to draw a penalty, and they play a style completely different than most Lincoln hockey fans are used to watching at the IceBox. Despite all of that, the Cedar Rapids are a team the Stars have had a lot of issues with in the past. The Riders are traditionally a small, fast, shifty team and at times the Stars have had problems keeping up with their team speed. On Saturday, the Stars will look to increase their road winning streak to two games (baby steps) when they travel east on I-80 to battle the Des Moines Buccaneers (19-22-4, fifth place in the USHL Western Conference). This will be the fourth time the Stars and Bucs have knocked heads this season with Lincoln holding a 3-0 record in their previous three meetings. The Stars have outscored the Bucs 12-2 in their last two meetings, both blowout wins at the IceBox. On paper, it appears that the Stars should have their way with the Bucs again this Saturday, but that might not be the case. Since losing 7-0 to the Stars at the IceBox back on 2/3/12, the Bucs have rebounded and have a respectable 6-3-1 record in their last ten games. One of the biggest reasons the Bucs are playing better as of late is goaltender Pheonix Copley. Copley, who attended the Lincoln Stars' 2012 tryout camp in Minneapolis back in June, was recently traded from the Tri-City Storm to the Buccaneers. Since arriving in the stunningly beautiful metropolis of Des Moines, Copley has a record of 6-2-0, a goals against average of 2.23, and a save percentage of .929. Considering how Bucs goaltender Jason Kasdorf as looked against the Stars this season (not good), I would not be surprised to see Copley in net against Lincoln on Saturday night. Against the Stars this season, Kasdorf is 0-2 with a 7.00 goals against average and a .803 save percentage (see, I told you it wasn't good). Although both of the teams the Stars will face are hovering, or barely above .500, neither game is a guaranteed win. The Riders are always a tough game for the Stars, and the Bucs are playing some of their best hockey of the season right now. If the Stars want to leapfrog the Omaha Lancers (who play three games this weekend) in the standings and into first place, they'll have to play 60 minutes against both teams to earn the four points. Reminder: The Nebraska girls state high school basketball playoffs are in town this weekend, and it appears there will be a games held all weekend long at the Devaney Center. In particular, Omaha-Central plays Papillion-La Vista at Devaney at 7:00pm on Friday night. Be prepared for more traffic, incompetent out of town drivers, and UNL parking nazis. Oh, joy. I think I might leave at noon and maybe will be parked in time for the start of the second period at the box, ha!! It's game day! !